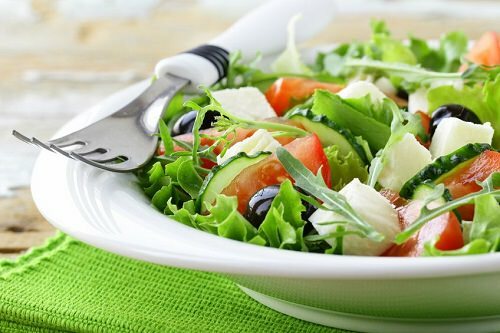 You make a Greek salad with all the usual salad ingredients – ripe tomatoes, red onion, cucumber, bell pepper, black olives and parsley. For the Greek dressing, mix oregano, oil and vinegar in a pot, stir thoroughly and then pour. Crumble up some feta cheese (Greek cottage cheese made of goat’s milk), sprinkle it on the salad and serve with toasted pita bread.